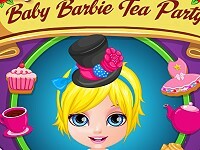 Baby Barbie has recently opened her own Cupcakes Shop were all the children will visit it to buy their favorite dessert. Can you give her a helping hand? Start by dressing her up in a cute dress and of course an apron and then enter the kitchen and help her to mix all the ingredients, bake the cupcakes and then fill them with the cream you've prepared together and finally decorate them in the super amazing My Little Pony style! Follow the instructions step by step to mix in a bowl all the ingredients: egg, flour, sugar, milk, baking powder and vanilla. Pick up a great flavor for the cupcakes like coffee, chocolate, cherry, candy or orange. 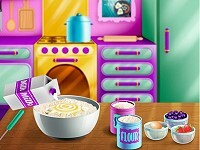 Mix all the ingredients, pour the dough in a cupcake tray and place the tray in the oven to bake at medium heat. 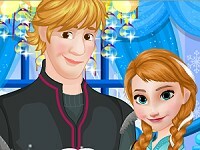 When the cupcakes are ready, you get to have lots of fun decorating them. Try different frosting, sweet flakes, syrup and many other sweet decor to make the cupcakes look great and also taste delicious. 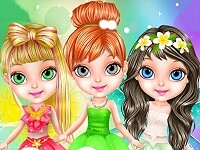 Have a super fun time playing this awesome new free online flash Baby Barbie dress up & cooking game for girls here in Minigames.com!